We have 6 grandchildren over 20 and 3 of their birthday's are the first week of January and one on the 28th of December.....right after Christmas when my pocketbook says ouch! It has been nice this week to have time to work on the January cards. I have finished 2 with one more to go, so I will be showing those to you this week. I used some paper I had in my stash to make this black and white card. This is a 6x6 card, with a black border underneath the patterned paper. The flowers are part of the paper and are velvet. I added a beautiful Bazzil button in the middle of the largest flower. Wish you could see the glitz it creates. 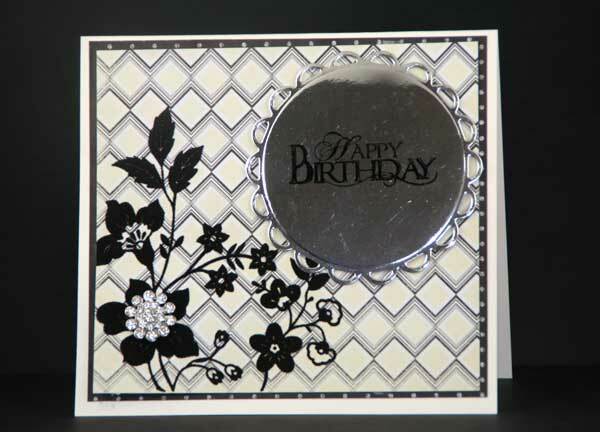 Using my new Lacy Circles and silver card stock, I cut out the circle with my VAGABOND. I cannot tell you how much I love that machine. The circle was popped up with adhesive pop up dots. This was a fairly quick card, but very classy IRL. Please excuse the glare of the camera on the silver card stock, but no matter how I tried I couldn't remove it. By the way, I have plenty of Spellbinder Lacey Circles and Squares in stock now!!! I received a new rack for my ink pads for Christmas. I will be taking pictures of it to show you soon! This card is really pretty. I love the way you used the button. Gorgeous card, Joan! Black and white is so elegant. I'm hoping to get some time tonight to play. Since all my kids are at home I want to spend as much time with them as possible. Who knows when I'll see them again. Happy 2011! It's beautiful Joan, I really like the paper you chose, it's so elegant with your design. We're still at the beach, having a very nice, relaxing time. Hope all is well with you! Big Hugs!!!! Love this card Joan... Hope you and yours are well this holiday season!!! Ooooh, I love your card. I think I am in love with black this year. And wouldn't you know, someone told me that gray is the new black. I knew you would be creating this week. You could not possibly wait till Jan 3rd! Thanks for sharing, Joan.